Five reason’s why mindfulness should be on your new year’s resolutions list – according to science! At this time of year we all think about a clean slate and starting anew but research shows 80% of us have let our resolutions go by February. So what can we do to support our goals, dreams and aspirations that we sincerely intend at the start of January? Learn to meditate! It’s not that our resolutions are unachievable; we’re simply not starting from the right place. To achieve anything, we need to be aware. Only with awareness can we effectively manage our thoughts, feelings, and behaviours to consciously move toward our goals. The benefits of meditation are proven from improved sleep and reduced stress, to better relationships and communication. Beginning a meditation practice is free and can be integrated into any of our daily activities like cooking, cleaning, walking or gardening. The simple act of being present with what you are doing can soon become a way of being. Meditation will benefit your mind, your body, and your brain. 1.Meditation can sharpen your ability to concentrate rather than being distracted. 2.Meditation focused on compassion makes you more likely to actually help someone in need. Meditation practice helps ease symptoms for people who have experienced trauma or PTSD. After thirty hours spread over eight weeks of Mindfulness-Based Stress Reduction practice, the “fight or flight” part of our brains (the amygdala) reacts less strongly to stressful events. And these are just the benefits at the outset, among beginners. Seasoned meditators (who have meditated for thousands of hours over their life) show long-term lasting impact from meditation. For long term meditators one day of meditation shuts off genes that create inflammation throughout the body. Inflammation is the cause of numerous diseases in the body if there was a pill that could do this we would all be taking it – so why aren’t we all meditating? 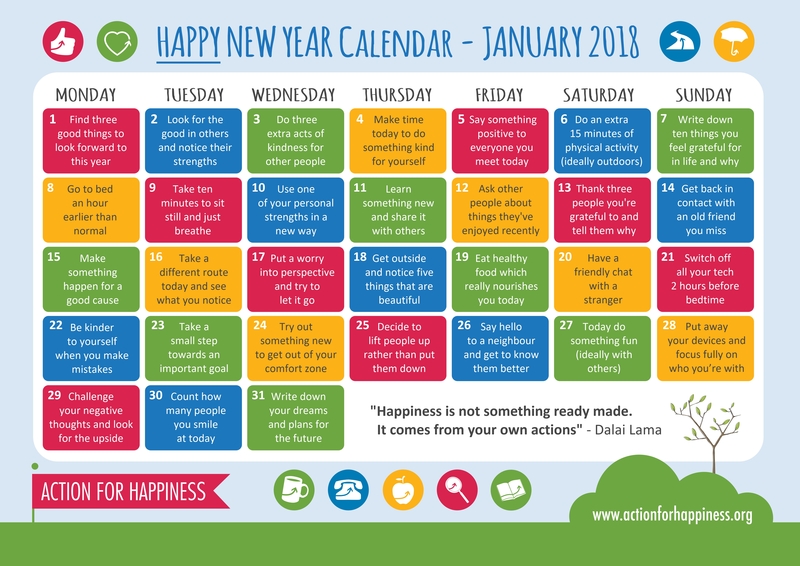 The picture above is from ‘action for happiness’ and is wonderful guide to mini-positive steps you can make every day in January to help nudge your brain in a positive direction.